Music is integral to our worship and a crucial part of Sunday morning service. Vigorous, enthusiastic congregational singing is encouraged, supported by a fine Austin pipe organ. A variety of musical groups invite your participation at Trinity Church. Please see below to learn more about our specific music groups, and consult this website’s calendar for specific rehearsal times and special events. All are invited to make a joyful noise to the Lord! This talented group of adults sings at one Sunday service each week and at other special liturgical services and Feast Days from September to June. With rehearsals on Thursday evenings, membership is open to all adults who love to sing and are committed to the music of the church. Enhanced by five professional singers, the choir learns repertoire from the Middle Ages to the newly-composed, in a setting of education, fun and Christian fellowship. Choral singing experience is helpful though not essential. The Choristers, Trinity's youth choir, provides an excellent foundation for later music experiences, allowing younger children and older youth to sing together a repertoire that is both accessible and challenging. 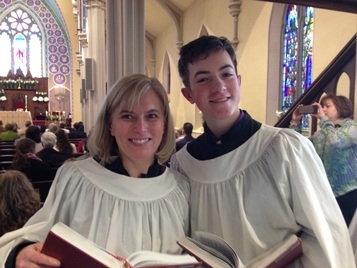 With music ranging from medieval chants to contemporary anthems, choristers deepen their sense of history, liturgy (worship), language and art, as well as their ability to interpret both text and music. Weekly instruction balances warmth and humor with structure and attention to detail, nurturing the development of accomplished musicians and responsible young people who, as they grow to adulthood, understand what it is to be at the vibrant heart of worship. Our choir is also a member of the Royal School of Church Music in America and, as such, participates in the Voice for Life training program for choristers. The Trinity Choristers accepts boys and girls entering the second grade through ninth grade who have an interest in teamwork and music and who desire the challenge of being part of a first rate choir. The group gives these talented children the pride of being part of a great choir, a sensibility for music and poetry, and the self-discipline to become skilled team players. Our beginning choir for kindergarten through second grade, the Primary Choir is the first step into the organized choir system at Trinity, serving as a training ground for our Choristers. Primary Choir members gather for 30 minutes each week during the school year to learn basic rhythm, singing and music notation skills in an environment of fun and fellowship. Activities include playing instruments, singing hymns, anthems and other fun songs. The choir sings in church every four to six weeks. Re-Creation, a group of pianists, guitarists and singers, supplements the the more formal choirs with songs of contemporary Christian music during some of our Sunday services during the school year and our periodic outdoor services in the Summer. The Re-Creation music group was started at Trinity over ten years ago to praise the Lord in song. 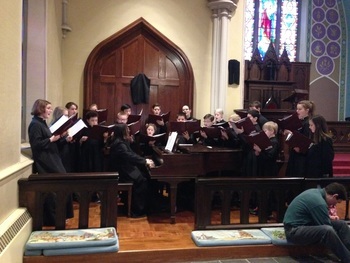 During that time, the group has performed regularly at Trinity and other venues in the area. The requirements for membership are simple: a love of music and willingness to attend the rehearsals and services. A group of men and women, boys and girls who come to sing and play together, leading the worship in the style of Taizé. We gather prior to each of these prayerful (and musical) services to rehearse, then lead the congregation through the songs. Please join us!